one product, so many uses. 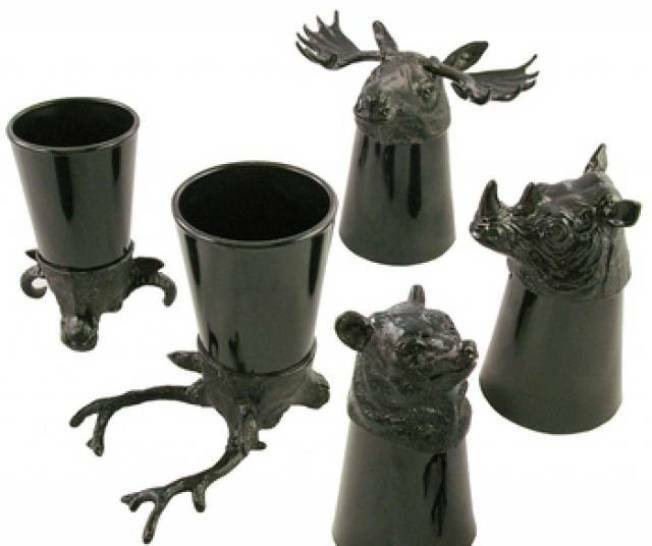 DEER SEASON: Animal instincts are in full effect with these black shot glasses with pewter animal heads. The bull, bear, moose, deer or rhino are designed to balance on their nose and ears/horns when flipped and can also be used as a paperweight or candle holder. Available at A+R Store. SOCK IT TO ME: You could spend beaucoup bucks on a pair of furry boots, or you could be economical and add these brown beaver faux trimmed socks with brown double satin ribbon tie to that pair of hot boots already taking up space in your closet. Then when you’re not in a “fur” state of mind, take them out and wear them without. Get them at Alternative Shoes. HAND WARMER: Gloves are essential in this city, but so annoying because they limit texting capabilities. The Smitten Mittens by Lululemon are merino cashmere blend and fold back easily, so you can grab what you need without taking them off. Get them here.